Thomas Hobbes famously described human life as “solitary, poor, nasty, brutish, and short”. Those five adjectives have become emblematic of a conception of human nature which understands that there is nothing redeeming about humans at heart. It’s a vision which requires the state to have the necessary apparatus and powers to ensure that individuals are properly enjoined to it. The purpose of this enjoining is to deprive individuals of the ability to oppress, which they naturally would do, given they only care for their own interests. And if you come to a similar conclusion when reading the papers, it’s probably not too surprising. Yes, you might think, the state probably does need greater surveillance powers to curtail potential terrorist threats; yes, greater intrusion into personal communications is warranted; indeed, sacrifice human rights if it saves lives. But in Oslo, on Saturday, we were given an alternative vision of human nature and the possibilities for our societies, which often goes under- or even un-remarked. 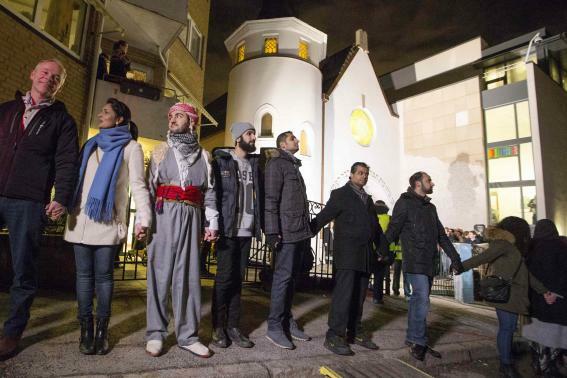 More than 1,000 Muslims linked hands to form a symbolic ring of protection around the city’s synagogue. This was not only to protect Jewish residents, but to protest against the attack on a synagogue last week in Copenhagen. Now, a potted history of Judeo-Islamic relations is probably not required. Suffice it to say that the relationship has not always been peachy, and fundamentalists of all stripes have sought to raise tensions between communities, with the recent killings of several people in anti-semitic attacks in France and Denmark. At the protest, one of the organisers, Zeeshan Abdullah explained why it was necessary to not only challenge the growing tensions between the communities, but to the whole edifice of hatred, enmity and inter-communal violence: “humanity is one and we are here to demonstrate that,“ he said, and in a moving, clear protest, the protestors chanted “no to anti-Semitism, no to Islamophobia,“. Scandinavia is on high alert after the killings last week, and of course, since the brutal terrorist Anders Breivik killed 77 innocent people. But the protest remind us that no matter what kind of logic we have about humanity in general, nor what path we seem to be indefinitely on, there is always another way- the way of understanding and mutual sympathy.